Stunt riding arguably began in 1927 when the Royal Signals – the Army’s dispatch riders – formed the White Helmets Motorcycle Display Team and gave vertically stacked demonstrations of their precision riding. Then there was Evel Knievel in the late sixties throwing Harleys into fountains and buses. Where do I go to try it? Downloadable PDF workshop sheets are available at www.chrispfeiffer.com, covering wheelies, stoppies and donuts, but we’d recommend getting one-on-one tuition. Try Paul Gower’s www.thewheelieschool.co.uk (07877 722 863) at £175, or www.jimmyfireblade.co.uk for £200 (01507 462190). Both discount for group bookings. Physics, as you know, is being defied. 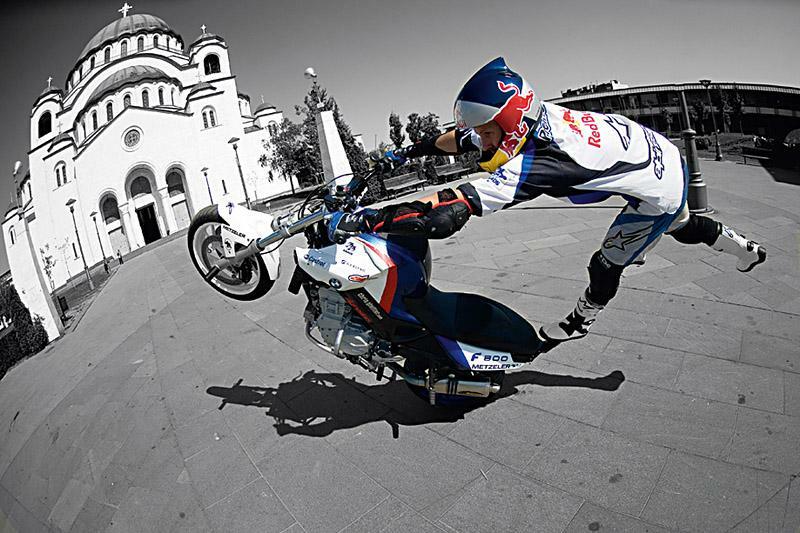 How many insane ways can you imagine a wheelie, stoppie and donut being performed? 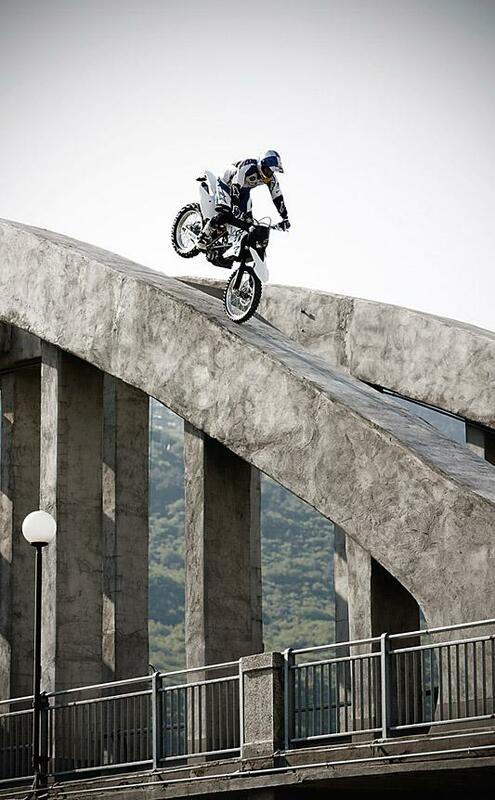 Times it by 50, as stunt riders continue to bust preconceptions and create a trick or combo that defies logic. Unlike racing, stunting championships are remarkable not by close-matched neck-and-neck competition but by the innovation and inventiveness of the riders. Each year another legendary rider pulls a new trick out of the bag, like no-front-wheel wheelies, cranked-over circular wheelies, or dragging the head of a small Chinese counterpart on the ground while performing a giant stoppie, a la Craig Jones. Jones makes things interesting by not only using a team-mate on his bike as a prop, but by riding Buells and Harleys. 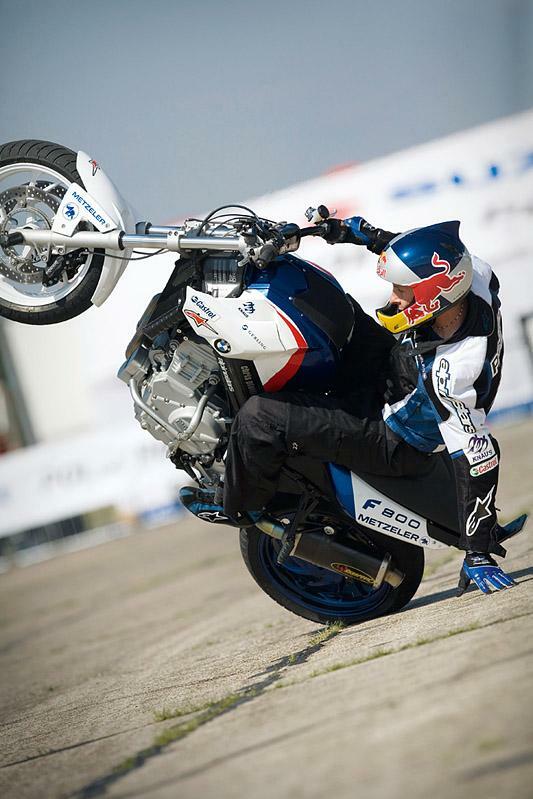 Unusual choices of machines seem to be the way to go, Chris Pfeiffer wins his championships on a BMW F800. Runs a hugely successful stunt show, sponsored by Harley and Buell. Current world champ and BMW-sponsored rider. The Godfather of modern stunting. Charismatic former champion regularly pipped to the win by Pfeiffer. You’ve just missed this year’s European Stunt Riding Championship in Austria, but current champion, Chris Pfeiffer will be at Donington performing during the new Superleague Formula event (a bizarre fusion of football and single-seater racing) on August 30/31. See www.superleagueformula.com or www.chrispfeiffer.com for more info.